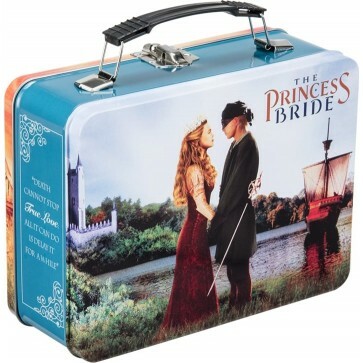 Whether it's holding lunch or storing gear, The Princess Bride retro tin tote is sure to please. It features a classic design, with a metal latch closure and collapsible plastic handle. Whether it's holding lunch or storing gear, The Princess Bride retro tin tote is sure to please. It features a classic design, with a metal latch closure and collapsible plastic handle. It measures 9 x 3.5 x 7.5" h. A must have for The Princess Bride lover.